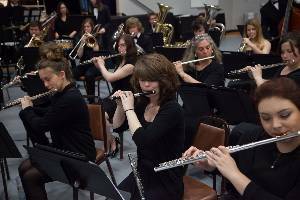 The Clark College Music Department presents extraordinary concerts and programs throughout the year for the college community and the greater community. Faculty and students work together to create professional level performances that are entertaining and provide students with valuable experience to help develop their musical talents. Designed to promote the choral arts, with expert clinicians creating an encouraging atmosphere of learning, the festival is open to middle and high school concert and chamber choirs. Each January, Clark music students receive firsthand experience in producing a major musical event as the college hosts the annual Clark College Jazz Festival. More than 80 high school bands and vocal jazz choirs from throughout the Northwest and Canada come to the campus to compete in this nationally recognized event. 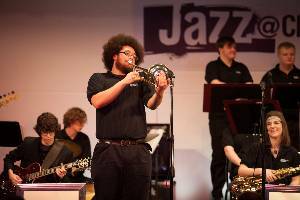 Performing groups present concerts each quarter, at various locations on and off campus, often with musical groups from other schools or the community. Performing ensembles have toured in Canada, Mexico, Japan, Korea, China, and Hawaii. Music will enhance your experience here at Clark. It will help complete the balance between learning a career and the need to express your creativity and passion. Making music with fellow Clark musicians will bind you into a community. Learn more about our music program.